Apistogramma expert Mike Wise has recently published what can only be described as a monumental piece of work over on Tom Christoffersen’s excellent website apisto.sites.no. The ‘article’ runs to almost 40 pages and comprises a detailed examination of South American paleogeography and its potential influence(s) on the subsequent distribution of the genus. Beginning with a chronological sequence and explanation of paleogeographical events occurring on the continent over the last 25,000,000 years, including colour maps, the piece continues with detailed accounts of how major geographical episodes may have shaped the historical and modern distributions of the various Apistogramma species-groupings we know today. 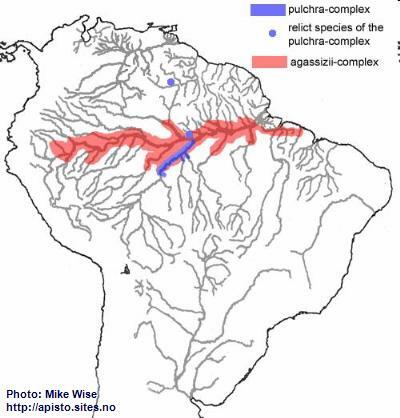 Although Mike freely admits this is not a peer-reviewed scientific work, the vast amount of research and personal knowledge in evidence result in some compelling hypotheses, and it should certainly be considered essential reading for anyone with more than a passing interest in this fascinating, species rich, group of neotropical cichlids. I have been an aquarium fish hobbyist for almost 40 years. I am a bit unusual (odd?) in that the first thing I bought wasn’t an aquarium and some fish, but a book – Exotic Aquarium Fishes by William T. Innes. Only after reading the book cover to cover did I buy a 5½ gallon aquarium. After all of these years, I still use both the tank and the book. My first fish were typical community tank species: neon and serpae tetras and a bronze aeneus cory cat. I was successful from the beginning; no problems with the fish or the tank. I credit this to reading the book first. I still keep and breed what most people call ‘small community species’, but my favorite fish are dwarf cichlids. Like most dwarf cichlid enthusiasts, my first dwarf cichlids were a couple of Blue Rams. A friend wanted to get rid of his Rams because, “they never show themselves”. I went to his apartment where he had a nice large tank filled with rockwork. Upon seeing the other fish in the tank, I wasn’t really surprised that the Rams wouldn’t show themselves. I was actually amazed that they were even alive, considering they were in a tank filled with Mbunas! I took them home and put them in my larger community tank. MTS (multi-tank syndrome) had already infected me. They instantly were out and about showing beautiful colors. I was hooked. After finishing graduate school with a MS in geology (biostratigraphy & paleoecology), I got a job and moved to Denver, Colorado. There I found a LFS that had a manager by the name of Sally Winkler. Sally was a d.c. nut and always tried to find apistos and other dwarfs. I quickly acquired several different species and started breeding them. The main problem back in the late 70s/early 80s was that there were no good books and very little information on dwarf cichlids. Sally suggested that I become a member of the American Cichlid Association. 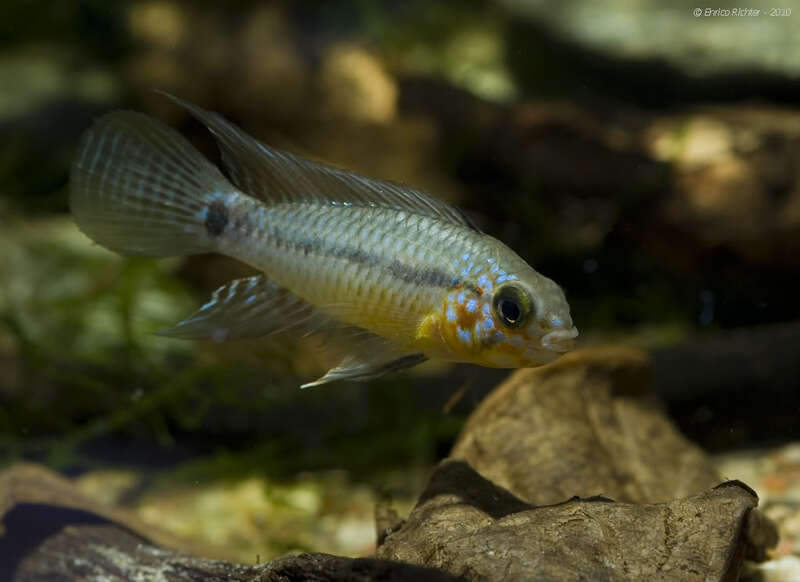 There I learned that there was the Apistogramma Study Group that was starting to re-organize. I quickly joined the ASG and got their quarterly newsletter, The Apisto-Gram. I then started collecting a library of scientific papers and books (many in German) on dwarf cichlids. In 1985 I became the technical editor for The Apisto-Gram. I also started selling the German book, Die Zwergcichliden Südamerikas by Werner Schmettkamp, with an English translation, with his permission. This was the only detailed book on dwarf cichlids at the time. Since them I have translated 2 books by Ingo Koslowski and helped translate parts of Dr. Uwe Römer’s Cichlid Atlas 2. With the inception of the internet, I joined several forums and developed friendships with many dwarf cichlid enthusiasts around the world. I have given programs to local, regional, national and international fish organizations. In 2008, my friend Tom Christoffersen (Larvik, Norway) invited me to join him on a four week trip into the Amazon of Peru and Colombia. It was the trip of a lifetime. This was not a ‘canned tour’. We were on our own. We decided where we would collect and even lived and ate with our native collectors much of the time. It was incredible to actually see the natural biotopes of fish we have in our aquaria, and collect new species. I hope to do it again soon. My paper on the paleogeography of South America and distribution history of Apistogramma species-groups, brings together two of my passions – Earth history and apistos. This is an article on which I have worked for many, many years – and which I still think of as a work in progress.